There are dozens of ways to rationalize the war. Who was morally wrong. Who was legally within their rights. I won’t bother. This is my vanity blog. It’s about how the war affected me. Not about whether such effects were justified. It was clear to me early on that Bill Gates was very wrong. Wrong in the word’s most practical sense. He had made an incorrect choice. His letter had pined for a few hundred hobbyists to pay hundreds of dollars each just to tinker. If only those who paid had used BASIC, it and Gates would have vanished into the obscurity of an insignificant niche. Instead, reality brought thousands of BASIC obsessed freeloaders whose “amateur” programs were creating a demand for millions of new microcomputers. Piracy made BASIC programming ubiquitous rather than niche. Instead of killing Microsoft it made their products virtually mandatory. By 1977 Microsoft’s failed a-la-carte BASIC pricing gave way to embedded BASIC. Licensing directly to manufacturers guaranteed Microsoft revenue and allowed users to perceived BASIC as free. It didn’t bother me that Bill Gates got rich. I liked the idea of software developers getting rich. That was what I wanted to do! What pissed me off was the hypocrisy of blaming hackers for his every misfortune, but offering no one credit for his growing fortunes. 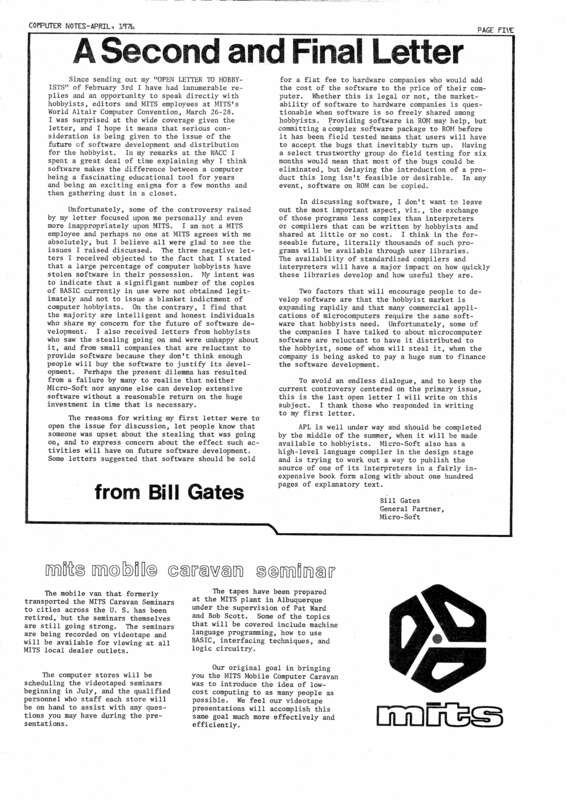 Gates had understood piracy’s business model by ’78. Everyone in the business knew by ’83 but none gave any quarter. Gates and his allies kept telling the media and government that young hackers and pirates were evil, immoral, and dangerous. They called us a threat to their industry. All while knowing full well that we were the industry’s future. Worst of all, the public believed them. I had my computer early so everyone came to me for solutions. It was all just magic and I was the wizard. No one asked me how I pulled off the trick. They just smiled, thanked me and off they went with their prize. Sometimes they even brought back cookies! It was usually my magical demonstrations and quick successes that sent someone out to buy their own computer. That’s where my troubles always start. Having their own computer subtlety changes their questions. I realized I was caught in a nasty conundrum the first time I used the obvious alternative. “OK, I’ll make you a copy of my disk and show you how to use it!” That provoked a reflexive media conditioned freakout. There is no pleasant way through the resulting social quagmire. If I explained to them they wouldn’t get caught, they thought I was immoral. If I told them there was no other way, they found me unhelpful. There was sometimes a thank you but rarely a smile. They usually refused to make eye contact as they carried the dubious disk off in a huff. I was no longer their friendly computer wizard. I’d become some sort of piratical criminal in their mind. One unworthy of cookies. I sold countless computers. Trained scores of new owners. Sent many off to buy stacks of disks. All free of charge. Yet my, now rich, adversaries kept telling everyone to watch me warily. I might be one of those hacker/pirate/phreaks you see on the news. It’s not that I wasn’t a hacker, pirate and occasional phreak. I was. So were Woz, Jobs, Gates, Allen and everyone of skill in the industry. That was how one got microcomputer skills. There was simply no other training program. You used any hardware you could reach. Read any secret you could uncover. Experimented with any code you could find. Called anyone who might know something new. The only difference was Gates and Allen didn’t have active adversaries hiding their reference material and blocking their experiments. No one called them thieves for plagiarizing and selling others’ work. No one threatened arrest for improper use of government computers. No one whined to congress they were destroying the CPU second industry. They got to join the computer revolution without the public hazing they were giving me. …and it pissed me off!